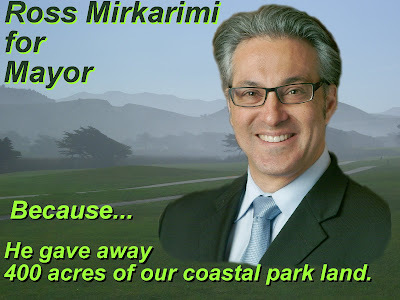 When Supe Mirkarimi mentioned Crissy Field, something didn't smell right. I had a feeling it was not a valid comparison. Too bad you didn't have the federal land info to fire back at him at the time. Keep after him, and thanks. Yeah, but in the blogosphere, there is no "last word". Even a lightly traffic'ed blog like this gets indexed by the search engines. One of these days, Mirkarimi is going to announce for mayor. When he does, people are going to start googling "Mirkarimi for mayor" on the intertubes, and this graphic is going to show up. Maybe it will mean nothing because he has come to his senses on this issue. Or maybe he will learn that giving away 400 acres of park land that belongs to the people of San Francisco, is not the best way to become the mayor of San Francisco. The closer you look at Mirkarimi, the worse he and his brand of "progressive" politics looks. Let's make sure he never becomes Mayor of San Francisco---or even sheriff. You can include me in the ABM (Anybody But Mirkarimi) camp.